The biggest asset for any company today is its talent. Because of that, businesses are moving from just “hiring people” to hiring the right people, at the right cost and the right time. As a part of this transformation, many recruiting teams are moving towards a model where they are developing sourcing expertise in-house, using automation to personalize their job opportunities, ensuring the right talent brand messaging is in front of the right individuals, and arming their recruiters with access to the right talent pools. 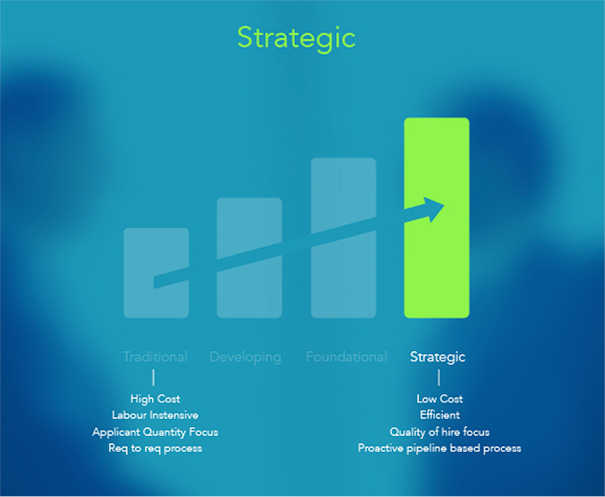 They are moving away from a reactive, traditional model and towards a proactive, strategic approach. LinkedIn has developed Talent Acquisition Maturity Model which reflects the different stages of the evolution of a recruiting organization - traditional, developing, foundational, strategic. This model helps you assess whether your organization is on the path of building a highly-efficient and high-performing recruiting team. As a recruiting leader or a recruiting team member, once you gauge the maturity level or your team, you can focus on developing the roadmap to build a more efficient and proactive recruiting team. 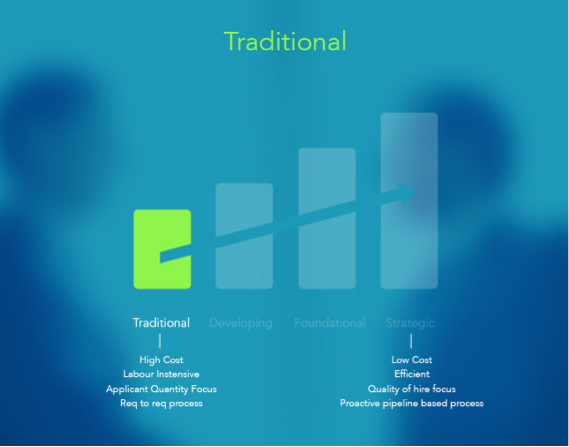 Your company is still at the traditional stage of the Talent Acquisition Maturity Model. The money you are spending is not creating enough ROI, while you face difficultly in attracting quality talent. You have a more labor intensive and reactive approach to talent acquisition. 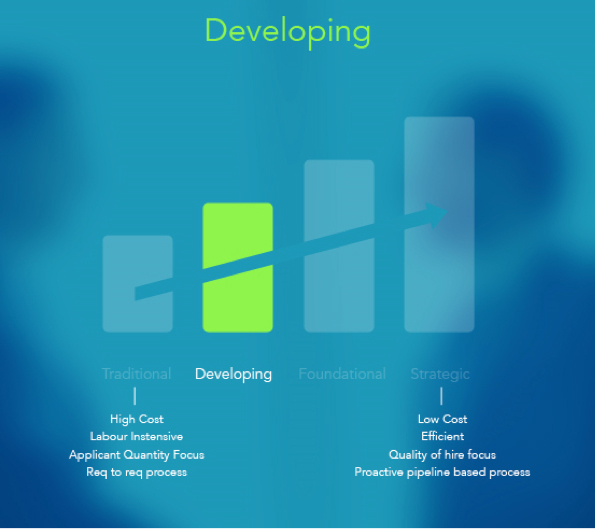 Your company is at the developing stage of Talent Acquisition Maturity Model. You understand the importance of good talent in your company and you're trying to reach out to a wider talent pool by using other platforms. But you're still spending a lot of money without getting any noticeable returns. 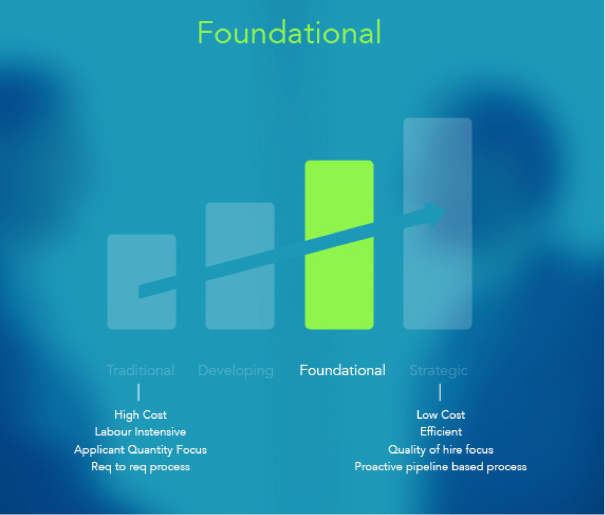 Your company is at the foundational stage of the Talent Acquisition Maturity Model. You completely understand how important it is to keep the potential and current employees engaged to save cost, and attract more talent. You also understand the importance of Data in recruitment, but you still need to achieve talent segmentation and create a talent brand to attract more talent. Your company has mastered the need and art of employer branding and utilizing it efficiently to attract a huge pool of talent, which are optimized and filtered as per your requirements. Not only are you saving money in the hiring process, you're also finding the right set of people for the job, with increase retention rate and satisfaction rate. Good job! Now that you have the results of where your organization stands on the Talent Acquisition Maturity Model, you can gauge and plan the different levers that you need to pull to move your team to a highly-efficient and high-performing recruiting team. In the meanwhile, we have few resources that can help you in this journey. 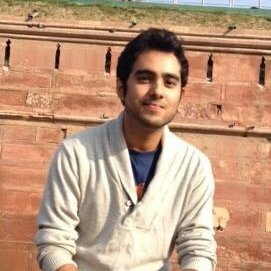 Build a robust talent pipeline: Download the "12 Steps to Building a Stunning Talent Pipeline Tipsheet"
Build a highly social talent brand: Download the "Employer Brand Playbook"
Build a data driven recruiting machine: Download the "Data Driven Recruiting eBook"
This post is co-authored by Pooja Chhabria.